All plans include 1 hour of Guided Training using your own datasets and Basic Technical Support for platform and tool issues. Priority Technical Support is available for prioritized feature requests. Additional Guided Training using your own datasets is available on request. Forecast how a country's electricity infrastructure will mature in thirty years after projecting village electricity demand and technology costs. 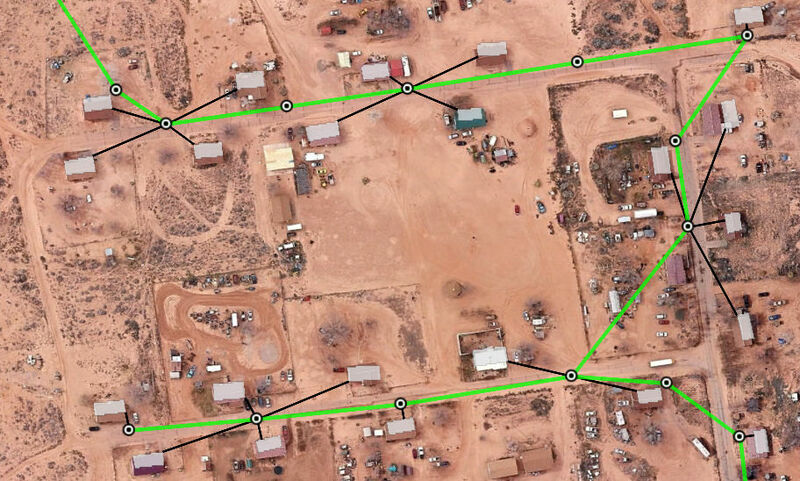 Stay up-to-date on villages where microgrids are at risk of competing with grid extension. Identify villages suitable for solar microgrid. Override up to 289 intermediate variables on a village by village basis. Recommend the least cost electrification strategy for each village by comparing levelized cost of electricity across the following technologies: Grid Extension, Diesel Mini Grid, Solar Mini Grid, Solar Home System. Save money on poles by optimizing the spatial layout of your grid extension. Save time by starting with computationally optimized pole layouts. Harness optimization algorithms to uncover multiple optimal pole configurations. Optimize the placement of service drop poles and distribution poles along roads and around obstacles. Identify the best cluster of households for installing a microgrid. See optimal clusters ranked by capital cost per household. 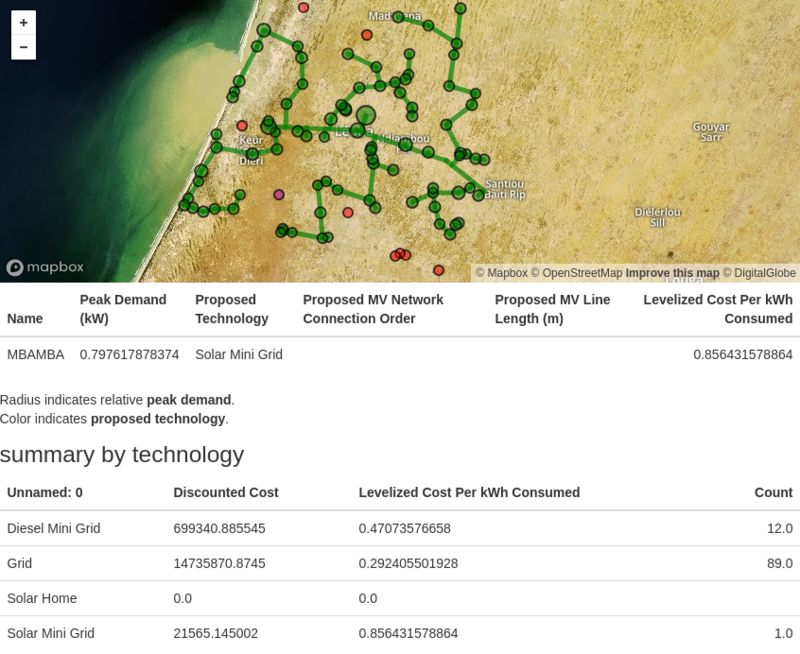 Optimize greenfield microgrid site placement by capital cost per building. 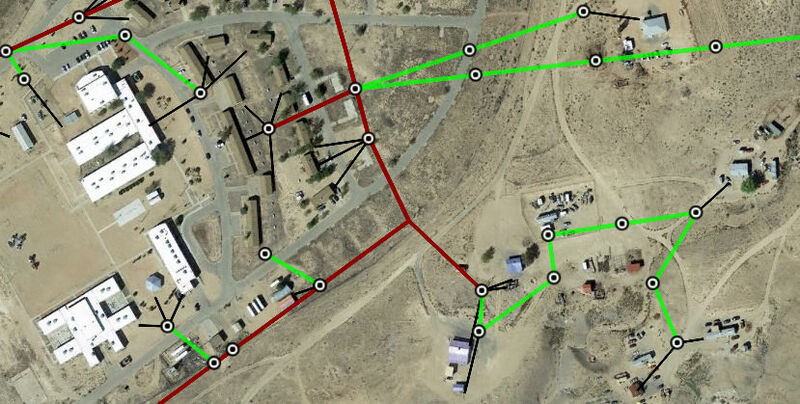 Save money on poles by optimizing the spatial layout of your microgrid. Ensure that your microgrid respects battery to customer distance constraints. Save money on expensive equipment by optimizing the placement of solar panels, wifi routers, street lamps, power meters and tall poles to maximize coverage and minimize cost. Get an up-to-date list of village locations in your region of interest. Get an up-to-date list of potential customer locations in your region of interest. Estimate customer ability to pay. Create a spatial database of your electricity distribution network that is compatible with freely available systems for power system analysis. Analyze potential physical and cyber vulnerabilities. Compare your asset profile against benchmarks.